Not everyone is going to want to play video slots on which a huge number of bonus games or bonus features can and will be triggered, however those types of slots can certainly be very exciting slot games to play. If you much prefer the more basic type of slots on which you will find a five video reel type of playing format and structure then you will find quite a number of them available at online casino sites using the Microgaming slot software platforms. One such slot that may appeal to you is the 5 Reel Drive slot, boasting its own unique Trucking theme this slot does not offer any of the usual bells and whistles you would expect from Microgaming, however it does offer a very substantial jackpot! With 9 optional paylines and a range of different staking options starting at just 0.01 you will find there is a stake level that will always suit your bankroll, but one thing to note is that just one single coin can be wagered on each line you do activate! The base game jackpot is a cool 10,000 coins which does give this slot something of a mid to high variance type of playing structure too. Alas, whilst you will find a set of scatter symbols attached to all five reels of this slot game the only thing those symbols will award you with when three or more of them have spun in is a scatter pays winning payout. This slot does not offer any form of bonus game and no additional bonus feature can or will be triggered when you play it online. What you will however find is that those scatter symbols can award a high valued staked amount multiplier when at least three of them have spun in, those payouts will award you with a x5, x20 and x50 staked amount multiplier when three, four or all five of them have been successfully spun into view. Another set of symbols to keep your eyes peeled for are the Wild symbols, those symbols are designed as Wild Road Sign symbols and they can and will stand in for all other reel symbols with the exception of the Scatter symbols. Those Scatter symbols will not award a cash payout in their own right, but they will stand in for all other non Scatter symbols. If you get three or more of them on an activated payline from left to right then the symbols they will become are the highest paying ones as listed on the pay table. 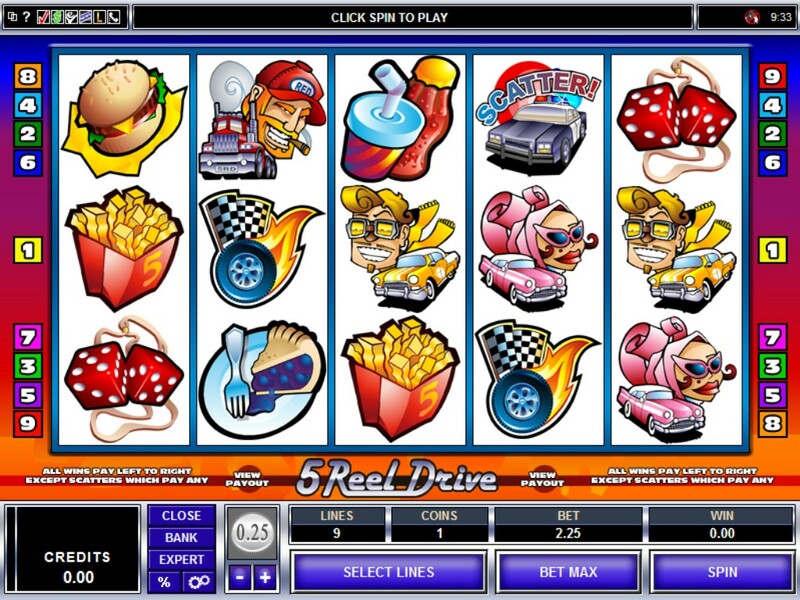 Due to the lack of any type of bonus game or feature round offered on the 5 Reel Drive slot you will certainly rattle through a large number of spins when playing it, however it does have one redeeming feature that being its payout percentage. We have found that many of the older styled non bonus game awarding video slots from Microgaming do offer some high long term expected RTP’s and that is certainly the case with this slot which has a very respectable payout percentage of 96.95%. So the 5 Reel Drive slot game will possibly be a perfect slot to play when you are using bonus credits and want to try and achieve the play through requirements of that bonus rapidly! Just make sure you pick out a staking option that will be suitable for your bankroll, and will let you play off a large number of spins on each single slot playing session you have.